The Park Slope Courier offers some extra details about the boutique hotel on Fourth Avenue that we keep writing about. The hotel, we're told, could open as early as January. Designed by Canada-based Andres Escobar & Associates, it will have 48 rooms and a "glass curtain wall." A number of the rooms will have balconies and in the words of the Courier offer "breath taking views of the Gowanus Canal" and Lower Manhattan. The architect of the new hotel is actually originally from Bensonhurst. As for the rumored restaurant on top, the Courier reports that the Department of Buildings turned thumbs down to a 120 person restaurant. The building still sports a sign advertising restaurant space for lease. The hotel is located on Fourth Avenue near Fifth Street. 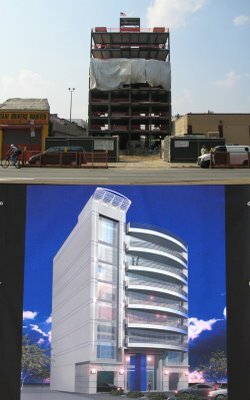 It is next to a large taxi depot and across the street from Leviev Boymelgreen's Park Slope Tower.